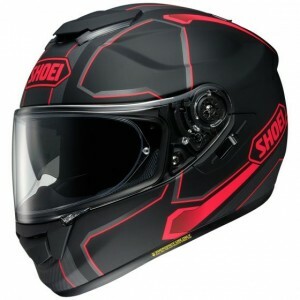 The ShoeI helmet finds ways to improve upon an already exceptional modular touring helmet. Exhaust outlets complement the upper air intake vents for improved air flow. Wind tunnel testing optimized the Neotec 2's aerodynamics to perform in a variety of riding positions. The integrated shell spoiler is repositioned to better reduce lift and drag at speed, while the Aero Deflector along the chin bar adds stability. A micro ratchet chin strap makes securing the helmet and removing the helmet quick and easy. Noise Isolator cheek pads improve the seal along the neck opening of the helmet to keep turbulent air out. The 360 Pivot Locking System secures the chin bar in the down locked position and a multi-piece EPS liner made out of varying densities of foam absorbs impact energy. The Shoei is designed to integrate with the Sena SRL Communication System for a clean and low profile installation. All of these features combine to produce one of the ultimate long distance touring helmets.